Back in the fall, I learned that one of my cousins would be getting married the following summer in New Jersey. Simultaneously, my husband and I were reading Washington’s Crossing by David Hackett Fisher. As we became more and more inspired by the heroic acts of this incredible man, George Washington, and the men and women of that day, we hungered to translate this incredible American history (which we did not receive in our school days) to our three children (ages 7, 5, and 9 months). It wasn’t long before we realized this summer wedding was right near all the “action” of the Revolutionary days. My husband and I were excited that we could attend my cousin’s wedding while making a vacation out of it and educate our children about our true American history! With that idea formulated, I began planning our revolutionary unit of study. To begin our itinerary, I started with how many days we had for vacation. We decided to take 9 days – two weekends with a week in between. Not long enough for me…I’d be on the road for 3 months if I could – but not without my best friend and partner along side to share the fun (and the work) this trip would entail. With 9 days at my disposal, I began feverishly planning all the sights we could see. My favorite trip planning sight is Trip Advisor, www.tripadvisor.com. It has recommendations from others as to what to see, where to stay and where to eat. Travelers rank those attractions (hotels, restaurants, etc.) and give you tips that only those who have gone before would know. It’s a great resource! I’ve found many great places to visit I would not have known about. And likewise, I was able to save time and money by skipping attractions (I thought would be good) thanks to the numerous traveler reviews. Such good info to know before hand! Kids to bed early for fun day tomorrow!! Valley Forge in the afternoon?? Perhaps a picnic dinner there? We can do a driving tour that will take about 30-60 min. “A 125’ tower completed in 1931 to commemorate the American Revolution. The tower boasts a commanding view of the Delaware River and surrounding countryside. Because we have three kids of different ages and needs, I planned the trip with room for flexibility. There were a few pieces of the trip that were in “stone” like the hotels I reserved each night, and two events that I purchased tickets for in advance. Though I’d like to see everything, I planned more than I needed, knowing some things might get scrapped at the last minute. I also know we’ll be back to see new things or revisit places we see this trip. So I approach this trip with flexibility and joy. The goal of our trip is to have fun as a family, create lasting memories, and learn along the way. Once the itinerary was set, I could begin organizing my lesson plans. I recently discovered “lap books” which are TONS of fun because we get at the heart of the lesson but with crafts and other kids centered learning activities. With that in mind, I found this amazing program: Time Travelers History Study Series: Revolutionary War! It is chuck full of activities for the kids that I could tailor to their grade level. We also checked out books – lots of them – from the library. We centered our study on the Liberty Bell, the Statue of Liberty, Washington Crossing the Delaware, art and architecture from that time period, our Founding Fathers, and more. There are wonderful children’s books on these topics which we would read at night before bed. Our lesson of study lasted about 3-4 weeks. I planned it so our studying time ended right before we departed for our trip. I figured the information would be fresh and exciting when we see the actual Liberty Bell or see the 12′ X 21′ painting of Washington’s Crossing by Emmanuel Leutze! 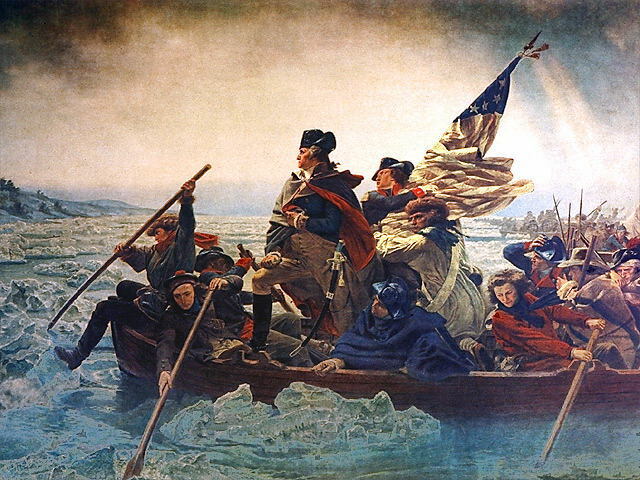 Magic TreeHouse: Washington Crossing the Delaware???? As we go, day by day, I have the children write about their activities each day. Before we left, I made journals for each child. I purchased “traveling” and “American” stickers for them to put in their journals. So when they write, they can add stickers or ticket stubs to their journals to personalize them. Then we’ll add the pictures when we get home. A perfect keep-sake for a wonderful trip! This entry was posted in Uncategorized and tagged homeschooling, revolutionary war, road trips, travel. Bookmark the permalink. ← Homeschooling: Where do I start?